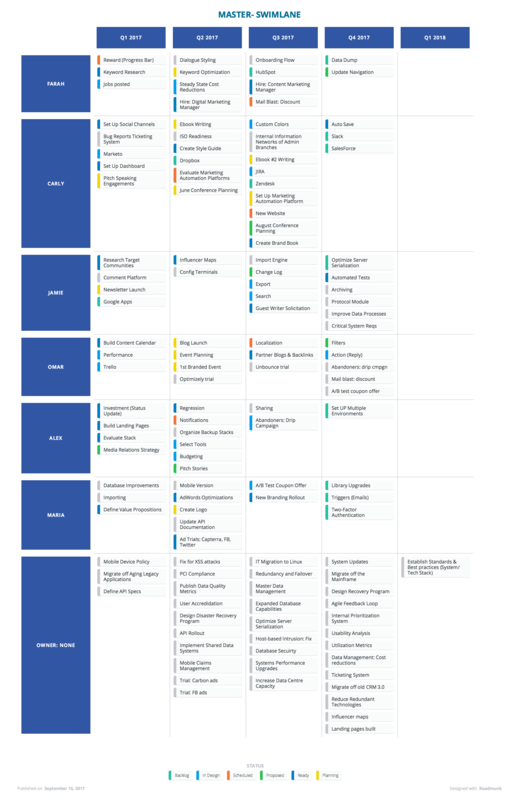 After you successfully roll up 2 or more roadmaps into a Master roadmap, you'll want to pivot your data in the same fashion you pivot your data in a Timeline or Swimlane roadmap. If your source roadmaps share common fields such as Status or Department, you can assign your headers (the same way you pivot in regular roadmaps) and sub-headers to sort your data from the rolled up source roadmaps to display by Status or Department, rather than simply by Source. You can also choose Source as a Header, which will use the name of your Source Roadmap as the header value. If all Source roadmaps use the same Status field, if you choose Status as a Header, all Items will have a Status lane to reside in. If none or some of your Source roadmaps share fields, it will be increasingly difficult to visualize your data in an organized manner. If none of your roadmaps share common fields, the best way to pivot your data would be by Source roadmaps. For more information on customizing your pivot headers, view the article on Customize the time pivot in a Timeline and Customize the time-based pivot in a Swimlane.